India’s recent development experience has been both a spectacular success as well as a massive failure. While our economy has grown steadily, this growth has come at the cost of environmental sustainability and has failed to translate into better living conditions for the majority of the Indian people. The Indian Economy is currently the fastest growing large economy in the world. Our GDP has grown at the rate of almost 7.7% in the last decade and was worth Rs 113.5 lakh crore in 2015-16at constant (2011-12) prices. It is forecasted that the Indian economy will continue to grow at over 7% in 2016-17 and could reach 8% or more in the next two years (Economic Survey). While this growth has undoubtedly led to some improvements in social indicators this improvement is far from satisfactory. With a Social Progress Index (SPI) of 53.92/100, India ranked 98 out of 133 countries in social progress in 2016 (Social Progress Report, 2016). The SPI is calculated by aggregating 53 indicators covering three dimensions: basic human needs (including nutrition and basic medical care, water and sanitation, shelter & personal safety), foundations of wellbeing (including access to basic knowledge, access to information and communications, health and wellness & environmental quality), and opportunity (including personal rights, personal freedom and choice, tolerance and inclusion & access to advanced education). There is perhaps no other example in the history of world development of an economy growing too fast for so long with such limited results in terms of broad based social and environmental progress. It is clear from the above that economic growth is not synonymous with development and that growth is but a means to development and not an end in itself. This implies that India needs to change the nature of its growth and transition to a better green, fair and inclusive economy i.e. 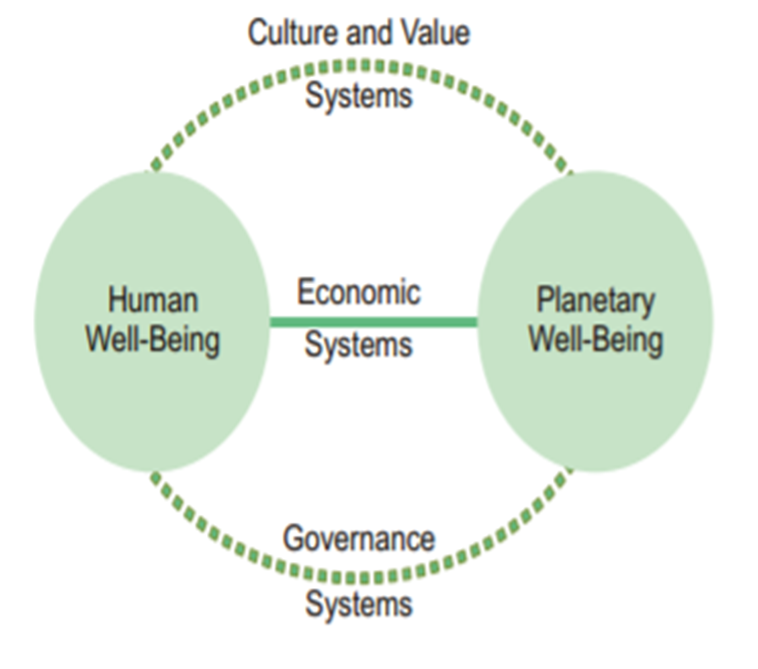 an economy that results in improved human well-being and social equity, while significantly reducing environmental risks and ecological scarcities (UNEP, 2011). In simple words it is one which is low carbon, resource efficient and socially inclusive. More importantly India needs to start making this transition now. For several reasons, it cannot afford the “grow now, pay later” model adopted by other developing counties like China or Brazil (Green Signals, 2015). Firstly, India’s population currently stands at over 1.3 billion people, 50 million of which are unemployed, 300 million of which are below the poverty line and 600 million of which can meet set of basic needs like food, energy, housing, drinking water, sanitation, health care, education and social security (McKinsey, 2014). As the number is expected to reach 1.5 billion in 2030 (UN Population division), India needs to be able to provide job opportunities and deliver a quality lifestyle to this generation without compromising the ability of its future generations to have at least the same standard of living. Secondly, a majority of India’s population is still rural and depends on the natural resources like quality soil, water, non-timber forest produce etc. for its livelihood. Thirdly, India is highly vulnerable to climate change due to its dependence on the monsoon, large coastal population, reliance on Himalayan glaciers for water security among other reasons. It is projected that if India continues on a business as usual scenario its GDP will be around negative 9-13 percent by 2100 due to the impacts of climate change (Carbon Disclosure Project). Finally, India is increasing facing environmentally caused public health concerns from unprecedented industrial and vehicular pollution and dumping of chemical waste and municipal sewage in rivers and water-bodies. Diseases associated with outdoor and household air pollution may have cost India as much as 8.5 per cent of its GDP in 2013 (World Bank). India today has the perfect opportunity to accelerate this transition having recently made international commitments like adopting the 2030 Agenda for Sustainable Development and ratifying the Paris Climate Agreement. The transition to this new economy has the chance to be based on current knowledge rather than the historical assumptions such as growth can be infinite or that it will always trickle down to those who need it most or that investing in the environment will undermine social progress. Moreover, economic systems have the opportunity to help the lives of the poor and most marginalised. It can bring new sources of wealth and investment; alternative jobs and sectors; and ultimately an economic system that is more resilient to withstand financial shocks and natural disasters. In order for this transition to effectively take place our economy will have to undergo a structural reform driven by new legislations, policies and practices. This will require changes across five action areas each of which interlink and reinforce each other (Green Economy Coalition). The first is better management of our natural systems. People, business and economies depend on nature for a stable climate, food, clean air and water, energy and raw materials. Yet we have failed to reflect that dependency in our economic activities and projections It is in our economic interest to ensure environmental stability, favorable climatic conditions and the on-going provisions of environmental goods and services. To do this requires stable investment, effective governance and resource-efficient and ecologically sensitive sectors that work with the natural world. Simultaneously we need to rigorously start investing in people. Our current inequalities and unemployment rates, particularly among the young, wastes human capital and hinders innovation. A healthy and educated workforce is the foundation of an inclusive economy. In order to generate better these better social and environmental outcomes we will need to change the production systems that use people and nature as inputs and impact them by their outputs by greening high impact sectors. In the Indian context these sectors are agriculture, manufacturing, power, transport and tourism. Changing the nature of production will require influencing financial flows since financial markets currently guided by short-term goals and an over reliance on financial derivatives, send the signals to investors and the real economy. This can be achieved by longer-term policy directions which renew confidence in green investment and through broader financial reform packages. Finally, none of this will be possible unless we redefine our understanding of progress and start measuring what matters. By focusing on improving only economic measures we have lost sight of the end outcomes we need to strive towards. We need to now align our indicators and governance arrangements with what stakeholders actually want and on what future prosperity depends. The road to a green, fair and inclusive economy will not be easy and treading it will require a strong collaboration between government, businesses and civil society who recognise that our economies need to be guided by different goals, sustained by different activities and deliver different results. Excellent article. How ever more analysis on natural resource management with aligning food security for green economy helps to understand better.